Waiting is hard for most of us. It takes patience. The ticking of the clock (do clocks still tick?) can seem interminable. And, perhaps it is increasingly hard because we are not used to waiting much anymore. With our mobile devices it is easy to distract ourselves from its tedium. God spoke into the nothingness. It sounded like a BANG! And God began to wait. Created matter cools ands clumps together. Stars form, live, and die. One day a mass of hydrogen ignites and an average yellow star appears—we call it “the Sun.” Matter begins to orbit around this star. Finally, some 9.3 billion years after The Beginning, there was Earth, “without form and void and darkness was over the face of the deep.” 9.3 billion years. Tick, tick, tick… Write down the number 29. Follow it with 16 zeros. That many seconds ticked by between creation of the universe and the formation of Earth. Tick, tick, tick…the waiting seems interminable; God’s patience, unimaginable. God created us to share in His life and in His love, to “partake of His divine nature.” Write a 4 followed by 17 zeros; that is how many seconds have ticked by since The Beginning. The number is too big to comprehend. Put it another way: only in the last 0.0007% of Time between The Beginning until today has mankind, as icon of God, existed. Tick, tick, tick… 99.9993% of Time God has waited for us. He is not in a hurry. At 8:15 on the morning of April 16th, 1924, she entered the world. Since The Beginning, each of her days was written in God’s book “when there were yet none of them.” He had plans for her welfare and not for evil, to give her a future and a hope. Then, for 13.8 billion years God awaited her conception. He knew the exact time and place she would arrive into the world. With each tick and tock He thought of her. Ninety years ago she was conceived and it has been eighty-nine years since her birth. She was intricately formed exactly as He had intended. Eighty-nine years: write a 28 followed by 8 zeros. Tick, tick, tick…each second of her life is precious to God. The 89 years is drawing to a close. God’s beautiful daughter lies unresponsive: one day, two days, three days, now four…345,600 seconds have ticked by since she last talked….it is we who now wait. And we wonder, “Why do You continue to wait, God?” We plead, “Take her now.” God remains patient, unhurried. He has waited 13.8 billion and 89 years to hold her. When finally He draws her to Him, He will hold her for eternity, seconds without number. BANG!, said God..it is now 13.8 billion and 89 years later and almost time for the Lover and His beloved to be united face-to-face. For all of eternity. God waits patiently for her; it is we who can’t wait. Physical death came last night, just six weeks shy of ninety. It has been 13.8 billion and 89 years since God first thought of His most beautiful daughter. Now she has come home to Him. 435,000,000,000,000,000 times the clock has ticked as He waited for her. They are finally together; Lover and Beloved now united. That is Love beyond measure. She is more alive than ever. It is our turn to wait to see her. And every bush afire with God. “Head’s down” is an old phrase used in aviation, specifically among pilots, to indicate that the pilot is busy with something inside the cockpit, such as reading a checklist or looking at navigational maps. In an airplane with two pilots, one might say to the other, “I’m going head’s down to program the navigation computer for landing.” It can be important for the other pilot to know because other than when flying in the clouds (a relatively short time in an average flight) it is critical for both pilots to be “head’s up” and looking out the window; after all, it is ultimately the pilots’ responsibility to see and avoid other airplanes as well as prevent an unscheduled encounter with the ground. Pilots are not the only ones who periodically operate head’s down. Recently, a women was walking head’s down, intently browsing on her cellphone. Distracted by what she was doing, she walked off a pier and fell into the ocean. Rescuers found her floating on her back holding her cell phone out of the water. I’m sure you know that this is only one incident in a growing trend of people walking, driving, dining, or in any number of circumstances, being distracted by their phones. Increasingly, it seems, we are a culture that moves through life with our collective heads down. It is easy to point at technology as the cause; however, I think it has only made a common problem worse. I think we have always been head’s down people. But now I’ve switched the meaning of “head’s down” just a little. Rather than being attentive to something right in front of us, I intend “head’s down” to mean our radical self-absorption. Mankind, by nature, is generally a self-absorbed, head’s down creature. Lately, out of the circumstances of my own life, I’ve been wondering about Moses. Perhaps you know his story, found in four of the first five books of the Bible (Exodus – Deuteronomy). Born a Hebrew slave, his mom placed the infant Moses in a basket and set him afloat in the Nile river. She did this to avoid his death at the hands of Egyptian soldiers ordered to kill all infant Hebrew boys as a form of population control. The basket was found by the Egyptian pharaoh’s daughter who adopted him as her own. He grew up in Pharaoh’s house. As a man, the Bible tells us, he killed an Egyptian for beating a Hebrew slave and then fled to Midian to escape the death penalty. If Jewish legend is to be believed, Moses grew up to be a man of great education and influence in Pharaoh’s court. After killing the Egyptian at the age of 27, he fled to Ethiopia and served as their king for forty years, eventually unseated because he was not Ethiopian. It was then at age 67 that he moved to Midian where he become a shepherd, married Zipporah, and had a family. Here is where my imagination takes over. As a shepherd, I imagine him in the desert feeling like a caged animal. He once had it all: a powerful man in Pharaoh’s court and then the the king of Ethiopia. He had the world at his feet. Now, he is a shepherd. I imagine him emotionally exhausted and unhappy, consumed with the what-if’s of the past and scheming to achieve his desired future: a return to prominence. I can see him in my mind’s eye, alone with the sheep “in the back of the desert”, so head’s down, so self-absorbed with his own misery, that every day for years he walked past God in the burning bush without noticing. And God let him walk by each day, inviting him with flames but never calling out to him to stop. In the Bible, God often uses the desert as a teaching tool. Again and again, people, including Jesus, find themselves in the desert facing the greatest battle of all, the battle with themselves. For Moses, I imagine God using the desert to begin to transform him from someone who lives head’s down in the inner torment of his life as a shepherd and into someone who lives head’s up. Only on the day he was first able to begin to look past his circumstances—the day he finally went head’s up—was the day he saw the bush literally afire with God, and he stopped. And only when he stopped did God speak to him (“when the Lord saw that he stopped to look, God called to him…”). Barrett Browning is right. The Earth is crammed full of heaven. Every bush is aflame with God. Rather than take off our shoes, we are so busy with our Blackberrys (smart phone or other self-absorbed distraction) that we no longer notice God—not that we ever did—and we walk off the piers in our lives suddenly finding ourselves floating in the ocean, holding up our phones, waiting for someone to rescue us. In our radical self-absorption we miss God at ever y turn and we wonder why we are so often cold and wet. Perhaps it is time for each of us to find a piece of desert, to enter our own cell and let God teach us to live life head’s up, with our eyes on Him alone. 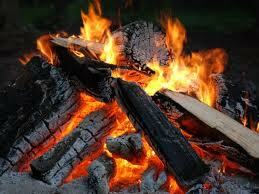 Come, remove your shoes and sit for awhile by the warmth of a bush afire with God.